Growing up my elders always told me, “the older you get the quicker time goes by” and man, were they right! Like many working mothers I wear many hats and I have found, after having children, that time speeds by even faster. My daughter, Josephine, is 17 months old and my son, Gavin just turned 3 on February 7th. To celebrate we had a party and of course this party had to have a theme, activities, prizes and not to mention a fantastic menu. The theme was easy, Disney Pixar CARS as Gavin is a HUGE fan! Decorations, no problem! Some handmade some store bought. Goody bags….check! Name the character trivia for the game and car related prizes such as car wash – piece of cake! Coloring books, crayons, stickers and more to keep the kids occupied – fantastic. Now the burning question….what will the menu be and how can I relate it to this theme? Hmmmm. I pondered for a while then thought, “my family LOVES Monical’s and the Manteno, IL location always gives great service and the food is out of this world”. That settled that question but now, how can I make it fit the theme? Looking at the menu and recalling the names of character in CARS it hit me; we will have – Ramone’s Rollies, Sally’s Salad, Route 66 breadsticks, Francesco Cheese Fries, Guido’s Italian Special Point Pizza and Tow-Mater and Cheese Pizza! What a hit!! Everyone revved their engines and raced to the food table to fill up their tanks and enjoyed every bite! Car related puns aside, the service and food as usual were fantastic and left them craving more! 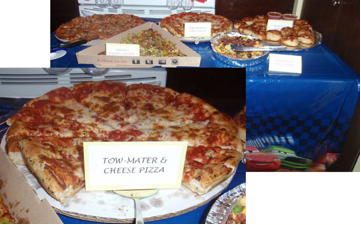 Thank you Monical’s for being a true “Family Pleaser” and for helping to make my son’s birthday party a true success!